This framed and mounted lithograph of the Dedication of the Masonic Hall in the Batesville Institute is a part of the Sheffield collection at Old Independence Regional Museum. The dedication took place in 1858, but the building burned in January of 1859 The Institute was rebuilt almost immediately. The second building was still a three story brick structure, but was simpler in style without a cupola. 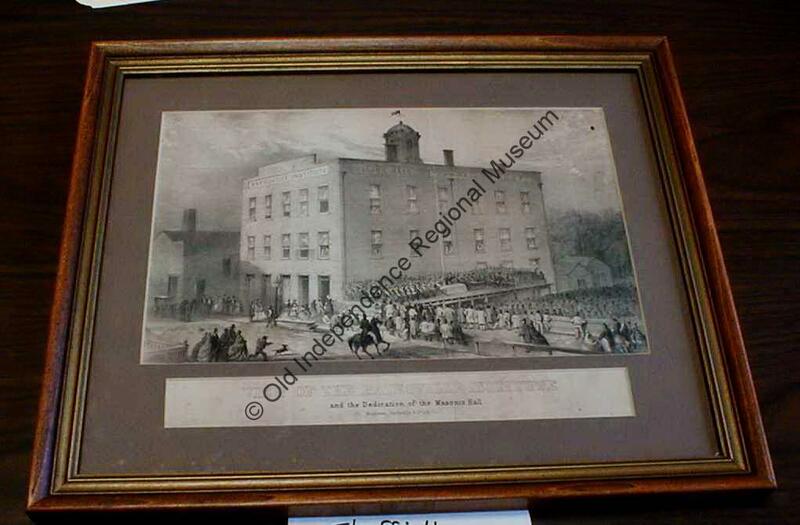 The lithograph shows the names on the building: Masonic Hall, Town Hall, I.O.O.F. and a large number of Masons are on the platform outside the building with a very large crowd gathered to hear. It was used as the headquarters for the U.S. Army Quartermaster during the Federal occupation during the Civil War. The story is told that President Warren G. Harding, a Mason, found the print in an Ohio junk shop and sent it to Mt. Zion Lodge #10. It was then restored and framed by Dr. Wesley Ketz. The Institute is the subject of an article in the ICHS Chronicle Vol. 35, no. 1&2, #112. I have been surfing online greater than 3 hourrs lately, but I never discovered any interesting aticle like yours. moe useful than ever before. I’m excited to find this page. I need to to thank you for ones time due to this wonderful read!! So if food processor hamilton beach; sn.im, doesn’t work in your case, do not be put off. You will find remedies you may consider. To stop comments I am told the following will work. If you want to stop receiving comment notification or start receiving notification on all comments on a particular blog, click the “Subscription Options” link at the bottom of the notification email. You can also use the link shown below. Full details on managing the posts/comment threads that you follow can be found on the Follow feature support page. Goood post! We will be linking to this great content oon our site. I’d like to thank you for the efforts you’ve put inn penning this website. I’m hoping to viww the sake high-grade content from you in the future as well. that if like to read it then my friends will too. page (pirater un compte facebook). Blog is using the free version of the Adventure theme. It’s an older theme.